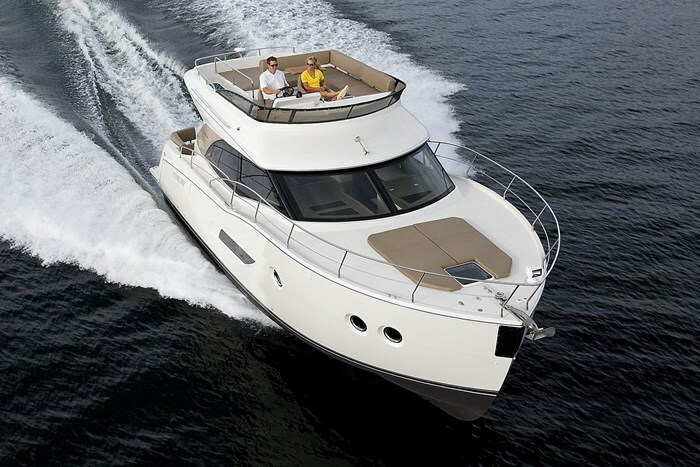 The C40, at almost forty feet length overall on a thirteen and a half foot beam, is a brand new model for 2014 for this Pulaski, Wisconsin builder which for about sixty years, has been renowned for its spacious flybridge and aft-cabin motor yachts. 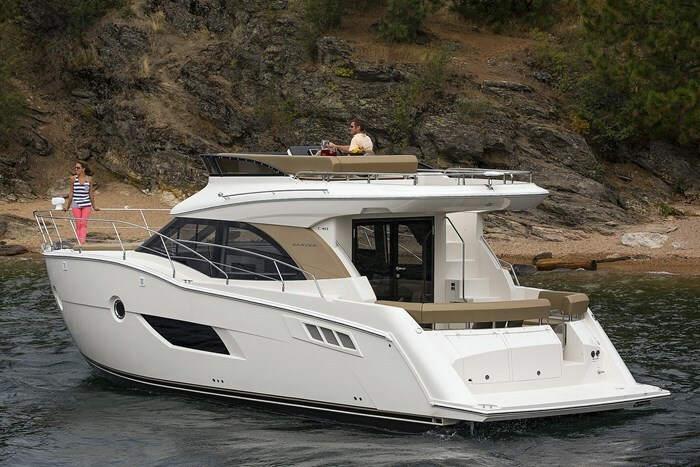 The C40 is the mid-range in size of Carver’s five models of flybridge and sedan yacht offerings for 2014 ranging from over thirty-five to over fifty-six feet. 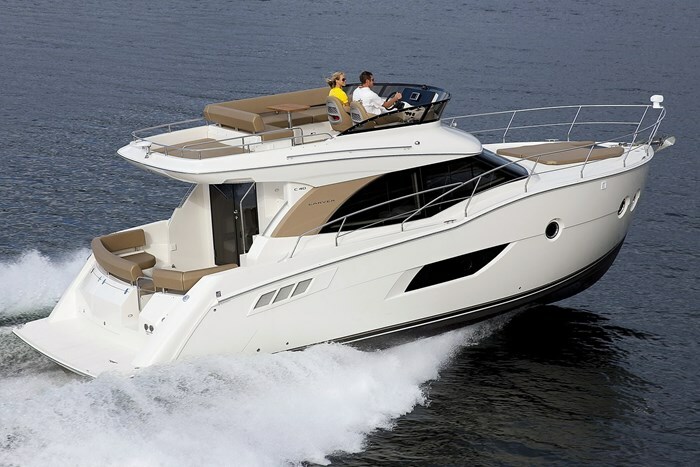 Carver has given the C40 what it describes as “distinctive exterior styling” which includes most noticeably the raised sheer with a high and rounded prow with steep stem and very traditional looking forward round hullside opening and screened portlights. 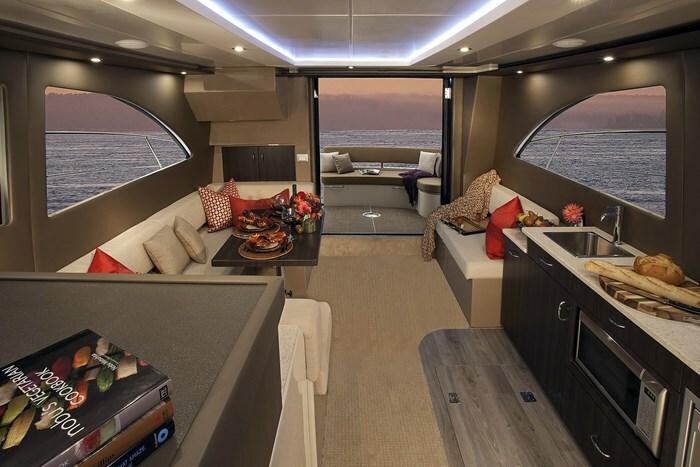 Also distinctive on the C40 is the spacious “command bridge” with its aft overhang providing the cockpit with some practical protection from sun and weather. The outer edges of the large full-width close-to-the-water integrated swim platform are an extension of the hull sides of the C40 making boarding via this platform much easier. There is lots of room on this platform for handling a dinghy. Two large transom lockers are provided and dockside electrical, water and fuel fillers are transom mounted for convenience. A starboard side of centre transom gate leads to a comfortable sized cockpit below which are the standard twin 305 horsepower Cummins 6.7 litre diesel V-drive inboard engines. These may be upgraded for twin 380 horsepower Cummins’ of the same displacement. You may prefer your own portable seating arrangement for the cockpit to keep it otherwise very open or you could choose from several options including either an ice maker or refrigerator or perhaps an L-shaped lounge seat with a single starboard side seat. You can also choose a table and snap-in carpeting. Cockpit fresh water washdown is standard. A molded-in easy access fibreglass staircase leads from the starboard side of the cockpit to the C40’s command bridge. Again this bridge is very open and spacious with two side-by-side adjustable helm chairs plus seating room for as many guests as you would probably want on the L-shaped lounge provided. Storage is found under this lounge. 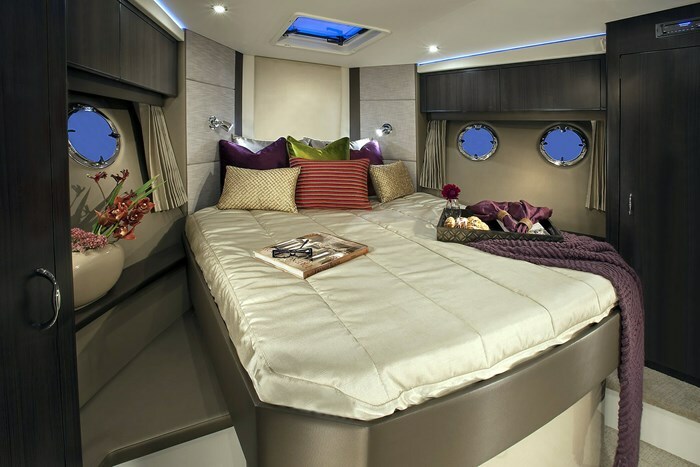 The aft third of this command bridge is devoted to a recessed oversized lounging sunpad. Dress up the command bridge with a table, snap-in carpet and of course a bimini top with or without enclosure and/or seat covers. A relatively high and tinted Plexiglas® air deflector wraps around the leading edge of the bridge. Behind this deflector at the helm, hydraulic steering is standard with a tilt wheel and digital LCD display for all necessary engine functions plus hour meter and rudder angle indicator. Trim tabs are standard as is an engine room automatic fire suppression system. Lots of room is available on the dash for the optional Raymarine® navigation electronics choices and you may also want to choose an anchor windlass, remote spotlight, bow and stern thrusters, and perhaps the Xenta® joystick control. From the cockpit, enter the salon of the C40 through double opening doors which, when both are open, allows full freedom of movement, conversation, and enjoyment among those in the cockpit and those one step down in the salon. 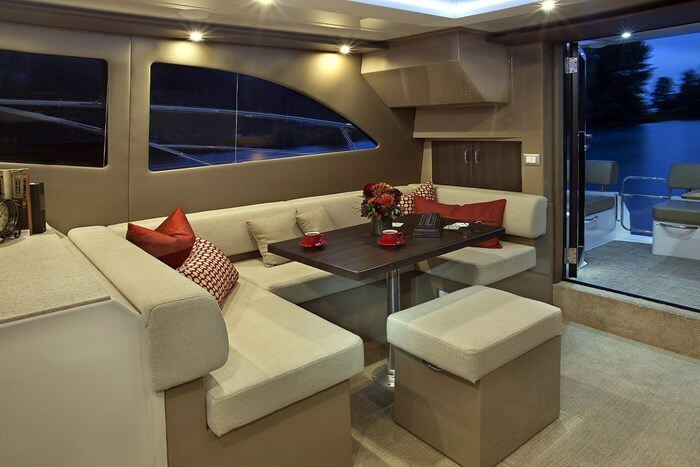 A U-shaped convertible lounge/dinette on the starboard side of the salon comes complete with a high/low table and filler cushion. Opposite on the port side is a facing couch. Salon headroom is 6’6”. Entertainment here is provided by an AM/FM/CD/DVD stereo and a 23” LCD television. 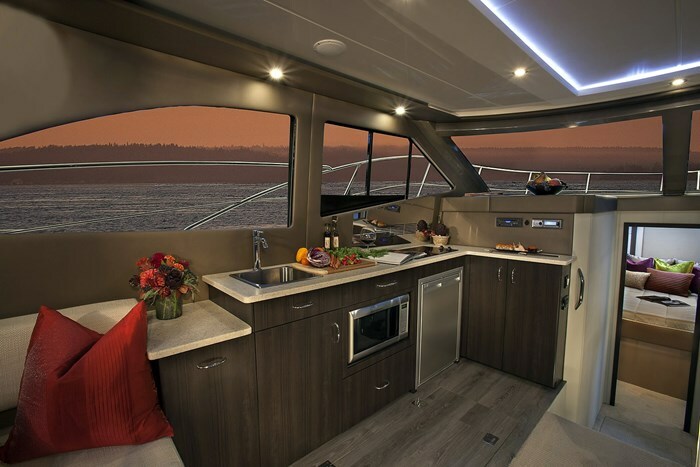 The very functional forward portside galley has loads of cupboard and storage space and includes a large stainless sink, oversized under-counter refrigerator, two burner electric stove, and convection microwave. The high and almost fully surrounding windows offer incredible natural lighting and visibility to the salon and galley and some of these windows slide open for ventilation. 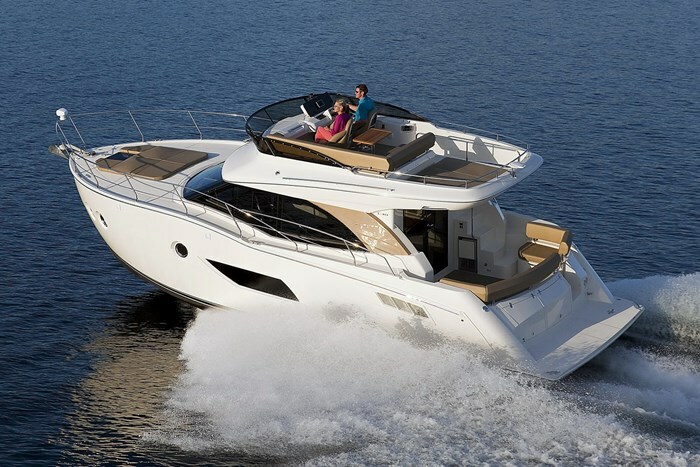 Of course you could opt for single or dual zone air conditioning/heating and perhaps the Kohler® 9kW diesel generator with sound shield to keep it all operating when you are not on shore power. 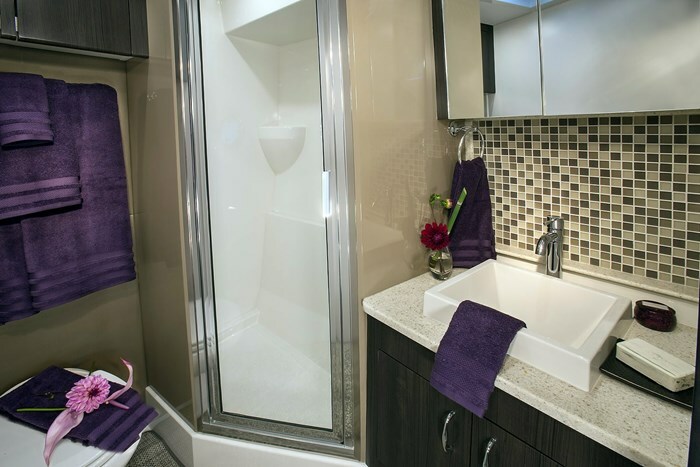 A couple of steps down and forward from the salon and through a solid door leads to the master stateroom with its island berth with high density foam mattress, dual end tables, hanging and overhead lockers, and master ensuite head on the port side with separate shower stall, vanity with vessel sink, storage and electric pedestal toilet. Just aft of this stateroom on the starboard side is the day head which is similarly equipped as the master head but without the separate shower stall. Aft of this day head is the guest stateroom with twin single berths which may be made into a full size berth with the filler cushion. You can add a 19” LED/LCD television/DVD player to these staterooms. 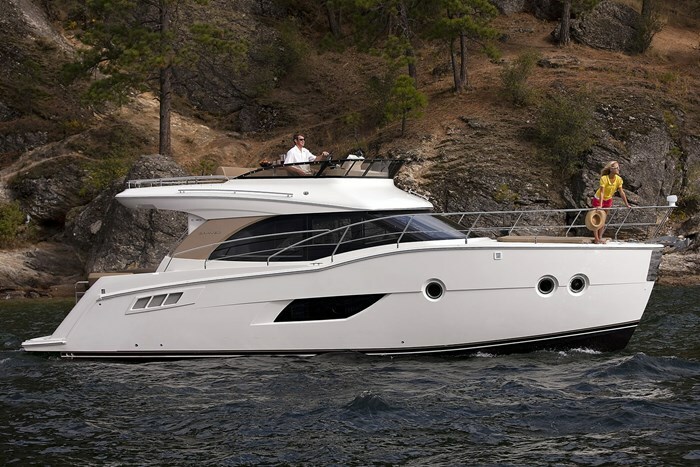 Carver certainly seems to have created a most comfortable, roomy and accommodating family yacht with this new C40.